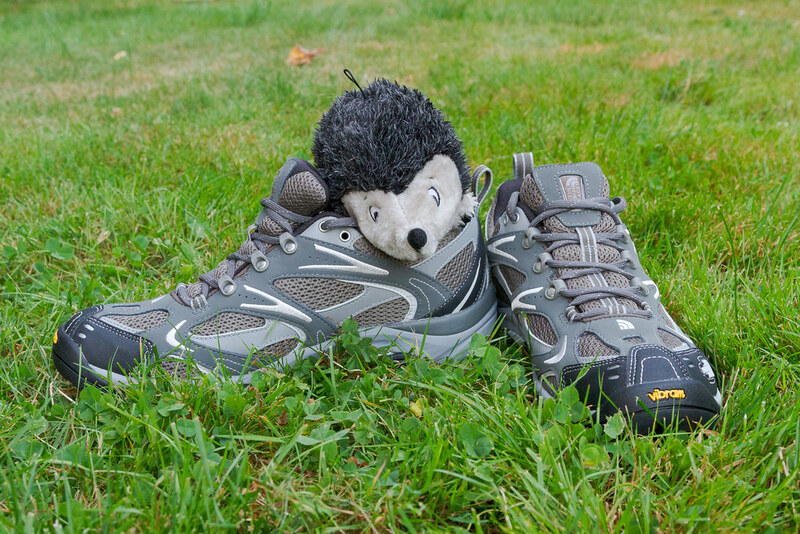 I needed new hiking shoes and when I saw that The North Face had a model named Hedgehogs, I took this as a sign from God. The problem with signs, though, is how to interpret them. Was this a sign that they would bring me as much happiness as Ellie’s hedgehogs bring her? Or a sign that she would chew my Hedgehogs as mercilessly as she chews hers? Ever the optimist I gambled on the former and so far, so good. I’m still breaking them in, REI didn’t have them in my normal size of 9.5 but half a size larger seems to be working OK. I wore them outside for the first time today on our evening walk, I’ll probably give them more of a workout in the Gorge this weekend to see how they do on hills. Plus I need to ease my body back into hiking if I’m going to take a big hiking trip late this month as I usually do. This entry was posted in General, Pets and tagged dog toy, Ellie, hedgehog, hiking shoes, shoes, The North Face. Bookmark the permalink. ← Run For Your Lives! It’s the Vampire Dog! Obviously you aren’t going today since you are still asleep.